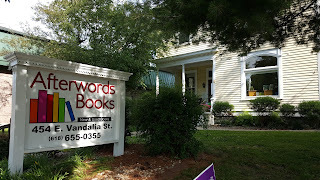 You can find just about anything on Route 66 - including 14 authors representing a variety of genres gathered together in one local author fair at the grand re-opening of a great indie book store in a historic tourist inn in Edwardsville on Blue Carpet Corridor weekend. It's the Blue Carpet Corridor Local Author Fair Sunday, June 14, at Afterwords Books, 454 East Vandalia Street - old Route 66 - in Edwardsville. The hours are 1:00 - 4:00 pm, and, depending upon the weather, you might find authors sprinkled about not only in the main building, but on the lawn and/or in the front cabin as well. Please come visit us this weekend! Author Fair runs from 1 - 4 pm on Sunday, June 14. Shane Bowen is the author of three novels currently available, titled The Order of George Ludwig, Cops and Robbers, and Out of Darkness. Five more novels are on the way, with at least one scheduled for print by the end of 2015. He has recently completed his masters degree at Greenville College, and plans to begin teaching in the fall. Elizabeth Donald is a dark fiction writer fond of things that go chomp in the night. She is a three-time winner of the Darrell Award for speculative fiction and author of the Nocturne vampire mystery series and Blackfire zombie series, as well as other novels and short stories in the horror, science fiction and fantasy genres. She is the founder of the Literary Underworld author cooperative; an award-winning newspaper reporter and lecturer on journalism ethics; a nature and art photographer; freelance editor and writing coach. She lives with her husband, author Jim Gillentine, and her son in a haunted house in Illinois. In her spare time, she has no spare time. T.W. Fendley is a freelance author and former journalist with 20 years of experience in corporate communications. A graduate of the 1997 Clarion Science Fiction and Fantasy Writers’ Workshop, her first novel, Zero Time, was published in 2011. Other titles include The Labyrinth of Time, The Mother Serpent’s Daughter, Jaguar Hope and others. Jim D. Gillentine is a horror-romance author born and raised in Memphis, lending a southern flavor to his creatures of the night. His debut novel, Of Blood and the Moon, was first runner-up for the Darrell Award in 2009. His most recent novels include The Beast Within, A Night at Death’s Door and Crossroads. He is pursuing his bachelor’s degree at Southern Illinois University Edwardsville. Cheryl Eichar Jett has been an Arcadia Publishing author since 2009. 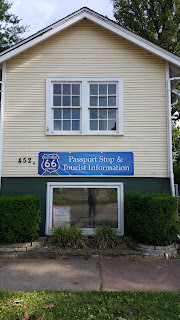 Route 66 in Illinois is her fifth book. She is a contributor to several magazines and writes the monthly column Along Route 66 for the Prairie Land Buzz, a regional online Illinois publication. Jett is a retired teacher and has spent more than a dozen years in service to history and arts organizations. Currently, she is working on another book for Arcadia entitled Route 66 in Kansas with co-author Joe Sonderman. Sandra Kohler Kohlbrecher is the author of the mystery novels Graffiti Bridge and New Haden, as well as a collection of short stories and memoirs in Words: An Anthology of Short Stories with the Highland League of Writers Group. A member of the Carlinville Writers Guild, Kohlbrecher is working on her next mystery novel and revised collection of short stories and memoirs. When not pursuing her writing, Kohlbrecher fulfills her other artistic talents, including art and photography. She lives in Highland, Ill. with her husband William and their black cat, Boo. Anthony Mathenia is a cofounder of Stache Publishing, an Edwardsville-based comic book publisher. Popular works include The Gunpowder Witch, The Crucible by way of superheroes; and Out of the Blue, an anthology of strange stories benefiting child literacy. Mathenia is also the author of Paradise Earth: Day Zero; the comic Pretty Face and other works of fiction. Ameedah Mawalin is the author of multiple short stories and novels, as well as a poet, spoken word artist and performer. Her newest ebook is Blinky!, which debuted as performance art at the Quaker House in Chicago on May 30. Her new science fiction novel, Red-Boned, will debut in late June, along with two short stories under her pseudonym, Ramona Sapphire. Linda Mitchell created the Photographic Celebration series of nonfiction children’s books. Being married to photographer Odell Mitchell Jr. has provided Mitchell with a plethora of photographs that document her children’s lives. Mitchell is a parent educator for the Parents as Teachers program in St. Louis and founder of the Metro-East Literacy Project. Cindy Reinhardt is the author of 150 Years of Hometown News, celebrating the sesquicentennial of the Edwardsville Intelligencer; Leclaire from Arcadia Publishing’s “Images of America” series, and numerous historical articles for newspapers and magazines. Her research into the history of the village of Leclaire began in 1994. Prior to retirement in 2009, she was employed at the University Bookstore at Southern Illinois University Edwardsville for 30 years. She is a member of the Friends of Leclaire, Edwardsville Historic Preservation Commission and Madison County Historical Society. Charles Schwend, author of Dragon Dreams, Words to Read - A Collection of Short Stories, Gulag #7 - the Authorized Biography of Karl Heinz Lorenz and contributing author to and book editor for Words, served 20 years in the U.S. Navy, retiring as chief petty officer. He founded the Highland League of Writers in 2008. Leisure activities include writing, beekeeping, wine/cordial making and mushroom cultivation. M. R. Sellars A member of the ITW (International Thriller Writers), M. R. Sellars is a relatively unassuming homebody who, in his own words, “tells pretty lies for a living.” All of the current novels in Sellars’ continuing Rowan Gant Investigations saga have spent several consecutive weeks on numerous bookstore bestseller lists as well as a consistent showing on the Amazon.com Horror/Occult top 100. M. R. Sellars can be located on the web wherever there is a virtual bar serving virtual single malt Scotch, single barrel bourbon, good Irish whisky, and decent beer. In other words, look for him on the major social networking sites and at mrsellars.com. John Smith, a native of East St. Louis, Ill., received his bachelor’s degree in magazine journalism before serving in the the U.S. Air Force as public affairs officer. After retirement, he wrote for regional and state publications as well as national and international magazines and newspaper advertising. His short stories appeared in Words: An Anthology of Short Stories and published a collection of short stories titled Nightmares of a Madman in 2013. He was editor of A Dark and Stormy Night, an anthology compiling 17 writers’ work, and has recently published another collection, Dark Dreams. Joe Sonderman is a Route 66 historian, collector, and author with more than a dozen books to his credit, most of them on Route 66 history. He is also editor of the Route 66 Association of Missouri's quarterly magazine, Show Me Route 66, for which he writes many articles, and is also a regular contributor to the international publication, Route 66 magazine. Joe is an avid collector of Route 66 postcards and photos, with thousands of his images available to view on his website www.66postcards.com. For 25 years Joe was an on-air radio personality in St. Louis. Now he keeps track of modern highways in his position at Missouri Department of Transportation. 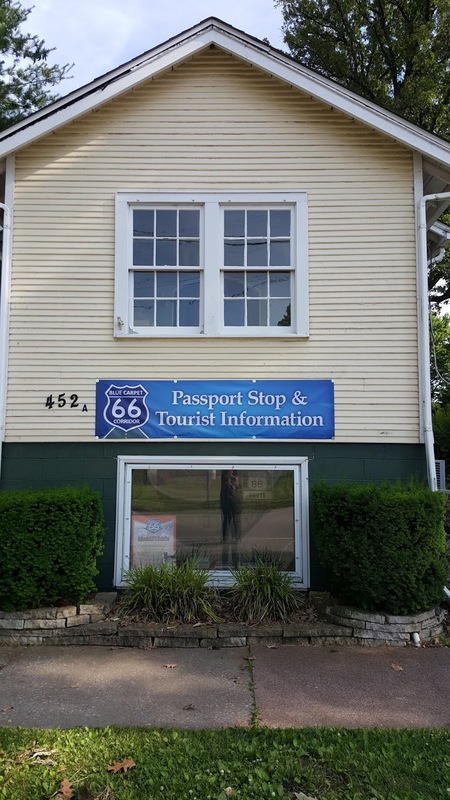 He is currently working on two new books - one on Route 66 signage, and the other with co-author Cheryl Eichar Jett entitled Route 66 in Kansas.